We are truly living in a 24 hour bakery over here!! Batches and batches of cupcakes drying on every surface!! Both Aaron and I have permanent hand cramps from all of the cutting! I imagine the Silver Bella gals can identify...putting together all of those fabulous kits!! Just when you think I 'd had enough cutting....I sat down to do some personal cutting! Inspired by the fabulous handiwork of Alicia, (Have a peek at her incredible vintage wallpapered patchwork closet door !!) 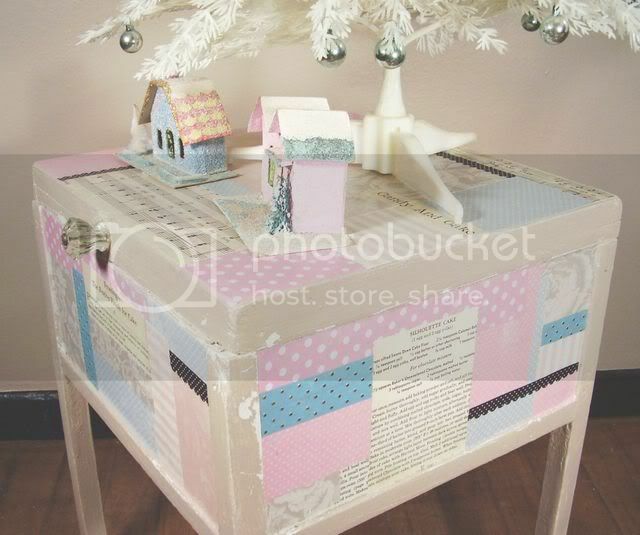 I revamped this super sweet tiny table "thingy" that we have had floating around for years! I'm not sure what it was actually used for. It is from the 40's and has a pretty vintage glass knob...and opens up...with a mirror attached to the inside lid! ( I plan on painting the inside a sweet vintagey turquoise) It is only 16" high...and is a 12" square. Any ideas on what it was for? I gathered up some of my favorite scraps of papers, new scrapbooking papers, as well as vintage sheet music, and vintage baking book pages! With no real plans...and a relaxed attitude toward the design (which is truly out of character) ..I just cut different shapes and sizes, and mod podged away! I am quite pleased with how it turned out...it is very happy and sweet, with it's chippy tan paint and all! 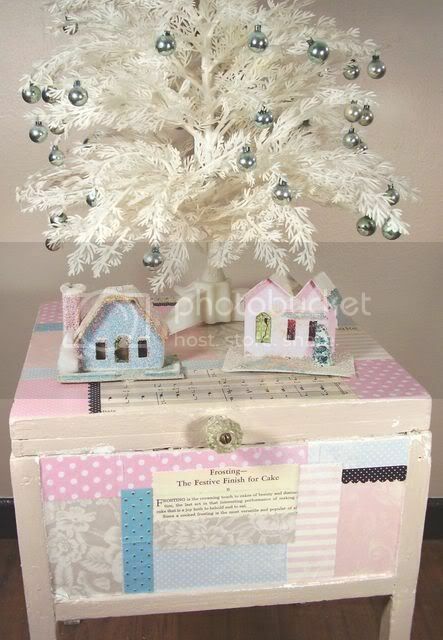 Perfect for my vintage plastic tree and a few cardboard Christmas houses! I am so thankful for Alicia's fab post!! What inspiration!! Thanks Alicia!! ohhh...and celebrating a One year blogiversary is my sweet and talented friend Kari aka ArtsyMama !! Stop over and join the celebration!!! How fun it is to consider a year of blogging, crafting, and meeting new friends!! So so cool!! I look forward to lots of blogiversaries!! Mine and YOURS!! everything looks so wonderful! I meant to email you through flickr - please email me so I can send you a HEY SWEET CAKES card from my shop! Oh Jenny! That table is just adorable! 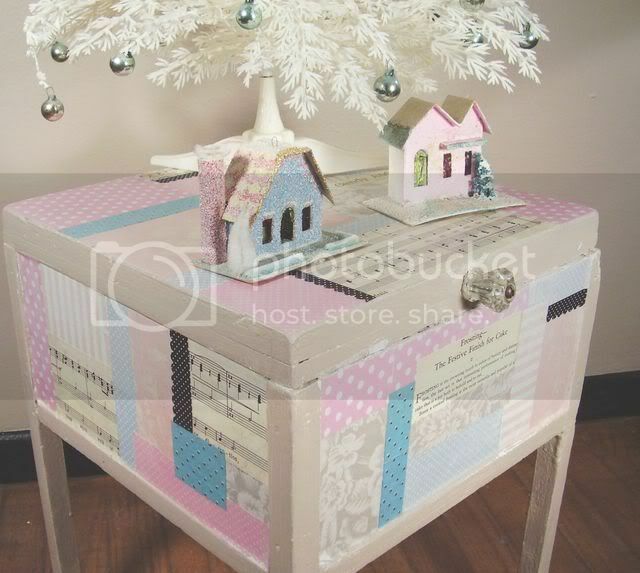 When the top of the photo came up on my computer I thought it was a professional photo, then I scrolled down and saw the incredible table I forgot about your dreamy white tree and great pink houses! Jenny -- this is just GORgeous!!!!!!!!!!!!!!!! Oh my gosh, Jenny, so many beautiful things to look at and news to catch up with. I saw the little house ornaments you sent to Teresa. Too sweet! I thought I should identify myself!!! I'm new to this whole blogging thing and must say that I enjoy visiting your blog!! This blogging is so addictive!! :) ...And so is the modge podging.... I also got the modge podge out and did some decorating of my own! Anyway, just wanted to say HI and I LOVE your work!!!!!! So much delectable color and inspiration,so happy I found your site!